Cronkite School Professor Tim McGuire, an advisory board member of a national organization that offers resources to media covering people with disabilities, will host a free webinar at 4 p.m. Tuesday, March 3. Register for the webinar here. During the webinar, hosted by the National Center on Disability and Journalism, McGuire will present ideas from his new memoir, his first book, Some People Even Take Them Home: A Disabled Dad, a Down Syndrome Son and Our Journey to Acceptance. The book tells of McGuire’s living with a physical disability and raising a child with Down syndrome. 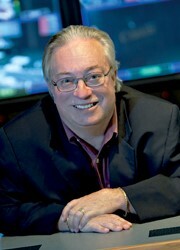 McGuire is the Frank Russell Chair for the Business of Journalism at Arizona State University’s Walter Cronkite School of Journalism and Mass Communication. McGuire,is a former editor and senior vice president of the Minneapolis Star Tribune and a past president of the American Society of Newspaper Editors. He has a rare congenital joint disability.